EN ISO 18674-1 Geotechnical investigation and testing - Geotechnical monitoring by field instrumentation - Part 1: General rules - ISO 18674-1:2015 lays out the general rules for the performance monitoring of the ground, of structures interacting with the ground, of geotechnical fills, and of geotechnical works. 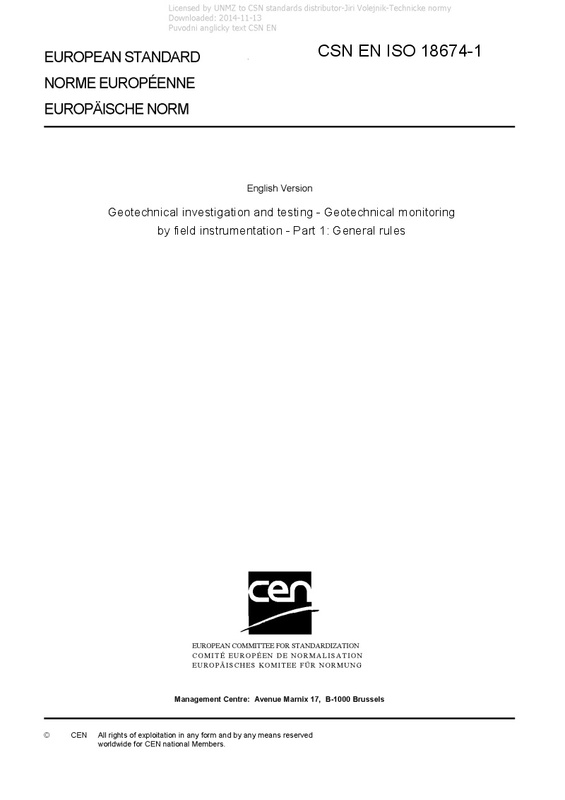 Specifically, it applies to field instrumentation and measurements carried out: in connection with site investigations of soils and rocks, in connection with Observational Design procedures, in connection with the performance of geotechnical structures before, during, and after construction, for ground behaviour evaluation, e.g. unstable slopes, consolidation etc., for the proof or follow-up of a new equilibrium within the ground, after disturbance of its natural state by construction measures (e.g. foundation loads, excavation of soil, tunnelling), for the proof or follow-up of the stability, serviceability, and safety of structures and operations which might be influenced by geotechnical construction, for perpetuation of evidence, and for the evaluation and control of geotechnical works.